Home » Facts » Food » food trip » foods » Health » Human Body » kids resources » Knowledge » People and History » How Long Can a Person Survive Without Food and Water? How Long Can a Person Survive Without Food and Water? I did, yes! Back when I was a kid – keep on asking what is the longest a person can survive without water or food to eat? Well, let us try to figure it out with amazing facts. If you've ever played on a sport in really hot weather, you know how quickly you lose water to sweating. The human body also loses water through urine and poop. This water must be replaced. Water regulates our body temperature, flushes our waste products, and helps carry nutrients and oxygen to our cells. That’s why doctors recommend that people drink at least eight cups of water a day. If you are very active or if the weather is very hot, you need to drink more. So how long can people survive without water? If they are heavy adults and weather is mild, humans can go without water for eight days. Under extreme conditions, when temperatures are high, a person might survive two days. When people don't have enough water in their bodies, they become dehydrated. At first the signs are mild. Your body won't produce as much as saliva and urine. If dehydration continues, your mouth becomes dry and your heart beats faster. With severe dehydration, your body produces no urine at all. What’s more…? People and horses are among few creatures that sweat. Most mammals cool off by panting. Dogs and cats have sweat glands on the pads of their feet and nowhere else. While no one can last long without H2O, a healthy person can go up to two months without eating. The human body stores energy in the form of fat, so the chunkier a person is, the longer he or she survive. As the stores of fat are depleted, the body starts to get weaker. David Blaine waits to leave his box after going without food for 44 days. He did drink plenty of water, however. David Blaine, the magician, went 44 days in 2003 without a bite to eat. 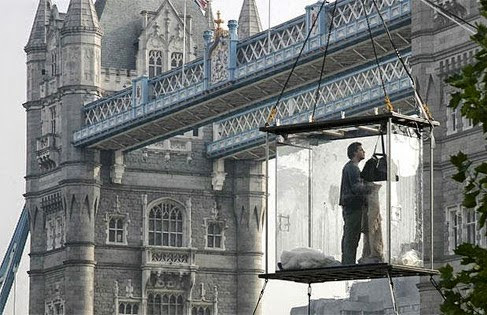 And he did so suspended inside a clear plastic box dangling over the Thames River in England. When his stunt ended, he had lost 54 pounds. Thank you for reading How Long Can a Person Survive Without Food and Water? posted on the website Kwentology if you want to redistribute this article please include the link as the source. Have some kuwento to share? Contact us!